Welcome to Gruver's Tree Farm located in New Cumberland, Pennsylvania. Originating in 1974, this 24 acre farm maintains 7 different types of evergreen trees. Whether you are looking for a Christmas tree this holiday season or looking to plant tree's for landscaping purposes, we are here for you. We offer wholesale trees for homeowners, landscapers, nurseries and developers. 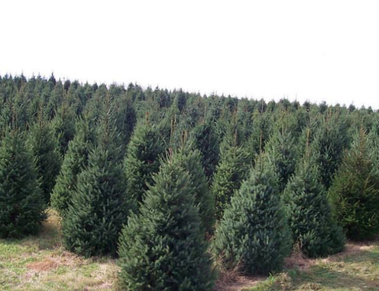 We also offer a large selection of pre-cut and cut-your-own Christmas trees every year during the holiday season. During the holiday season, we give you a saw and send you off to explore our fields, so you can choose and cut your very own Christmas tree! Along with tree sales, we also offer landscaping during the spring, summer, and fall months and snow removal to business and residential properties in the winter. Over the years, Gruver's Tree Farm has striven to maintain a family-friendly atmosphere while providing a great experience for our customers. Feel free to explore our site and find out everything we have to offer! T. Robert Gruver began Gruver's Tree Farm in 1974 in New Cumberland, Pennsylvania. Straight out of high school, Robert started his business doing landscaping for individuals in the local community and grew his business when he planted his initial seedlings of evergreens off of land he leased in Gratz, Pennsylvania. After a few years of growing evergreens and learning how to care for and plant various evergreen trees, he opened his first retail lot in his hometown of New Cumberland, Pennsylvania. After growing evergreen trees for about 10 years, Robert decided to expand his tree business to a larger location in the early 80's. Looking to purchase land that could accommodate the quantity and variety of trees he wished to grow, Robert purchased the land in which the farm sits on now. 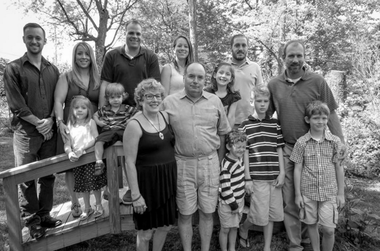 Over the years, Robert's business expanded and so did his family. The Gruver family works hard to guarantee high-quality and well maintained Christmas trees to the surrounding areas. During the holiday season, Gruver's Tree Farm strives to make the farm a warm and welcoming environment for all. We look forward to greeting old friends and meeting new ones as you visit the farm to find your perfect tree.